Working Grandfather clocks are certainly more valuable than broken ones. That’s why you need to preserve your valuable heirlooms.. Repairing Your grandfather clock is only a natural part of that preservation. What we’ve learned in our 50 plus years repairing clocks is that clocks that are maintained hold the most value in the long run. Before a complete repair is required you should continue to have your Clock maintained on a regular basis. Every two years is recommended by the factory. Using Clock Depot will ensure that you’re Howard Miller Clock will be restored properly and professionally. When the next generation does receive this heirloom, your Howard Miller clock will be more valuable than it was before, thanks to our quality repairs. Get in touch with us today for more information on how to schedule an appointment for your Howard Miller grandfather clock servicing. Remember, you don’t have to bring your clock to us. We come to the clock for all servicing. 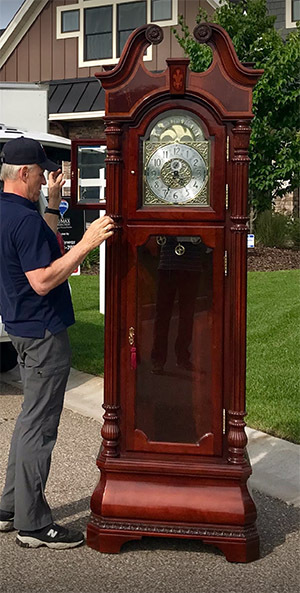 We are the premier grandfather clock repair company in the upper mid west.